So we're not traveling back to Minnesota, but I finally have time to share some photographs from our trip! Tonight is a little collage of some of the photographs I took at the Munsinger Clemens Gardens. 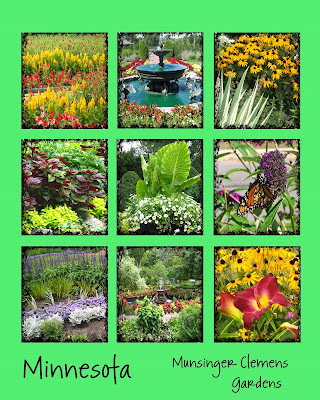 I shared some of the history about these gardens in my August posts. I had a great time here and I would recommend that everyone who visits Minnesota check these out. Enjoy the beautiful colors!